A Red Band Fish, Cepola rubescens, was caught on rod and line in deep water from Plymouth sound breakwater. This fish is an unusual angling capture. The Red-band Fish is a small fish, elongate like an eel, that lives in vertical burrows in mud. In February 1970, a Worthing fisherman found a fish amongst the seaweed after a bad storm that he was unfamiliar with. Unfortunately, the fish died before I could get there, so I sent the preserved body to Alwyne Wheeler who was able to verify my identification. 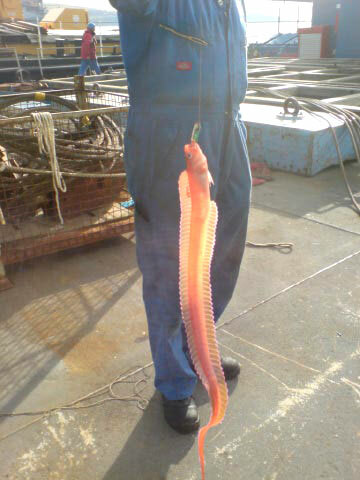 This fish is rare in the Eastern English Channel and I gave the fish to them for their collection. The Red Band Fish is a small fish, elongate like an eel, that lives in vertical burrows in mud. The burrows may be destroyed in storms and the fish are sometimes washed on to the strandline. off Plymouth, particularly after bad weather. > reports of this fish being washed up? > "It was approx. 300mm long, 20mm wide and 25mm deep. > teeth." (Michael Wattis by EMail).